Warrior Blu-ray Review. Warrior will have you sitting on the edge of your seat. It will draw you in and won’t let you go until the last frame and it is a film that cannot be missed. 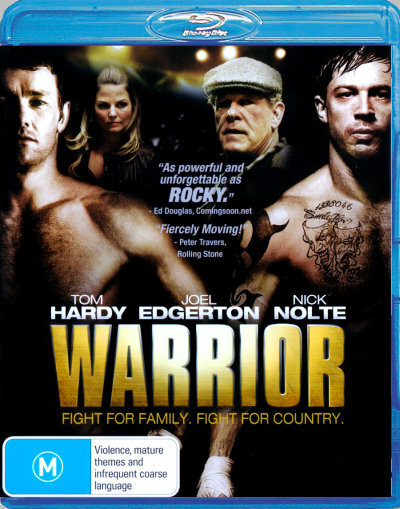 Former U.S. Marine Tommy Riordan (Tom Hardy) returns home after a 14 year absence to the doorstep of his father, Paddy Conlon (Nick Nolte), to enlist his help to begin training him for a Mixed-Martial-Arts tournament awarding the biggest purse in the history of the sport. Tommy’s estranged brother, Brendan Conlon (Joel Edgerton), a High School Physics teacher and former MMA fighter, struggles to provide for his family and they risk losing their home. By chance, Brendan is able to enter the tournament, which sets the two brothers against each other. Both of these men, having their own reasons to win, will face their demons, fighting their own personal battle while also competing through the biggest winner-takes-all tournament the sport of MMA has ever seen. Let me start off with Tom Hardy as Tommy Riordan…WOW! What an absolutely stunning and utterly convincing performance! What he gives us isn’t acting - it’s real. A real performance from such a gifted actor. Hardy plays Tommy as a hate filled and angry young man. Angry at his former abusive and alcoholic father. Angry at his brother for staying when he and his mother decided to escape their torment. Angry with himself and angry for the loss of comrades during his time away at War. Riordan is focused anger. He has a goal to achieve and a promise to keep and he won’t let anything stand in his way. With an intensity that is unparalleled, he’s like a coiled rattlesnake, just waiting to strike and when he does - it’s fast, brutal and totally unrelenting! Australia’s own Joel Edgerton plays the opposite side of this sibling coin - Brendan Conlon. Conlon is a family man, through and through. His whole reason for getting back in the cage, isn’t for personal gratification, or fame - it’s to protect his family - to ensure the financial security of his family and for his children to have a home to grow up in. Edgerton is convincing as the likeable physics teacher and family man, playing the role with enough charm without being too over-the-top and saves it from being too clichéd. He’s a man who doesn’t want to fight, but he knows it can provide what his regular 9 to 5 can’t, but at a price. He’s the underdog in this fight. He knows he shouldn’t be there, but he’s going to use this opportunity to do what he needs to secure his families future. But let’s not forget the one other great performance of this film and that is of Nick Nolte as Brendan and Tommy’s father; Paddy Conlon. Nolte was nominated for an Academy Award for this performance and unfortunately, he didn’t win, but it’s obvious to see why he got the nod and hard to argue that it is right at the top as one his greatest performances. Playing the former alcoholic and abusive father, now reformed and proud that he is coming up on his 1000 days of sobriety. Here he creates a man full of regret and sadness for the way he was and what his alcoholism did to his family - tearing them apart and driving his wife and youngest son away. It really is heartbreaking to see this man in some of the more emotional scenes of the film. Nolte just nails it and absolutely makes us feel for this poor, broken down old man. Yes, he has had a bad history, but he has done away what poisoned his life for so long, found God and is now trying to right himself and make amends for all the heartache and pain he has caused in his past. He now sees an opportunity to reconcile and reconnect with his both of his sons, and to mend the bridges that were broken between them so long ago. Both brothers, as fighters, couldn’t be any different from each other, and that comes from inside the film and their two different training styles. Tommy is a brute. A freight train of rage and intensity that goes from 0 to 100 in a split second, fighting forward with speed and power, totally pummelling his opponents and then leaving just as quick. On the other hand, Brendan is fighter of technique, not raw power. He’s an older, slowed down, calculating fighter, bringing a wisdom with age and experience. Being calm, studying, picking his moments while using endurance and submission moves to wear down his opponents. This film is a family drama set around the world of MMA and I have to say, it’s a hard hitting world. The second half of the film focuses mainly around the Sparta Tournament in Atlantic City, nicknamed; The War on the Shore. The one thing that really comes from it and is done so well, is that the fight scenes feel so authentic. This is owed to Greg Jackson, who is an MMA fighter and trainer in his own right. Bringing to the film his knowledge of different fighting styles used, how you would move in the cage, training, how the trainers speak to the fighters between rounds in their corners and techniques used to calm and prepare them for the next. It really is amazing to behold how much detail they went into and the film benefits greatly. The fight scenes are of the highest calibre and are fantastic to watch and they add so much to the emotional arc of the film. All these two brothers know is fighting. They can’t communicate to each other with words. They try, but it doesn’t work. The only way they can communicate is by fighting. It’s all they’ve ever known. When it comes to watching Warrior at home, this disc doesn’t offer the best picture transfer. It is a good transfer, but there is a lot of digital noise evident in the majority of the lower light scenes, but it really isn’t all that bad, for I felt that the look, particularly during the Pittsburgh scenes, with Tommy back in his home town with his father really added to the film and to the story and almost gave a sort of blue collar, low budget, documentary feel to the film, like we were there, sitting behind the camera ourselves, quietly watching this family drama unfold before us. For more die hard Blu-ray enthusiasts, you may not be entirely satisfied with the picture transfer, but I can say, while it may not be the best, I was able to look past it and it added to my overall experience of the film. With the audio, your system is going to get a great workout, especially during the second half of the film. With a DTS-HD 5.1 audio track, it really doesn’t get an better, with absolutely flawless and lossless audio quality! Listen to those punches and kicks! Extras included on this Blu-ray release are: Brother vs. Brother: Anatomy of a Fight, Cheap Shots: Gag Reel, Audio Commentary, Simply Believe: A Tribute to Charles Mask Lewis Jr. and Philosophy in Combat: Mixed Martial Arts with Frank Grill and Greg Jackson. The extras are quite good with the most interesting being the Philosophy in Combat that features Greg Jackson who was the MMA consultant on the film and a really fascinating guy, who goes on to speak about how he looks at the sport as an art form and deconstructing it down to it’s base element and seeing the beauty of this art which he loves so much. The Audio Commentary making a great addition as well, which features Gavin O’Connor (Director/Screenwriter/Actor/Producer), Anthony Tambakis (Screenwriter), John Gilroy (Editor) and Joel Edgerton. It’s a very informative, in depth commentary, going deeper into the film and the characters which is a great listen and great for the fans or people who want to learn more and to go deeper behind the film. It truly is a shame that this film didn’t reach the masses like it should have. From its $25 million dollar budget, it only made back just over $23 million of it worldwide, but figures mean nothing! This is a great film and half the fun about finding great films that haven’t really been seen by a lot of people, is applying a sense of ownership to it. I have no doubt that over time Warrior will find it’s audience and be appreciated by many more the way that I now appreciate it. Warrior is a very touching and satisfying film experience. One full of heart and rousing emotion that I absolutely recommend to everyone as a MUST SEE! It’s a film that shows us the strength of family and the bonds we share - that the human spirit cannot be broken. Warrior will have you sitting on the edge of your seat. It will draw you in and won’t let you go until the last frame and it is a film that cannot be missed.